Commercial Floor Cleaning | Floor Cleaning | All Building Cleaning Corp. Commercial Floor Cleaning | Floor Cleaning | All Building Cleaning Corp.
Resilient floors come in many textures, colors and styles and waxing and polishing floors, based on the surface style requires different techniques, equipment, treatments and specialization. Office floors are generally manufactured in three styles: plank, sheet and tile. — VCT (Vinyl Composition Tile) and Sheet vinyl. But they can also be made of marble or wood or stone. At All Building Cleaning Corp. we specialize in the cleaning of any floor surface, including wood, marble, stone and of course, vinyl. Our professional floor cleaners are trained experts in every type of surface. VCT comes in 12” tiles and is a porous floor material that can hold up well to strong alkalines, acid, and solvent spills and spots if cleaned up right away. Manufacturers recommend waiting 5 days after installation before doing any maintenance to the flooring. When sealing or applying floor finish to a new VCT floor, the factory finish needs be removed. VCT tile must be sealed with a sealer or sealer/finish. The same procedures and services apply to sheet vinyl. Cleaning marble flooring must be gauged by the frequency of foot traffic and needs to be observed at regular intervals to determine how much cleaning is necessary. The maintenance of marble has to be handled properly to preserve it shine and extend its life. Proper cleaning comes down to maintenance and the removal of stains and scratches. Floor waxing — cleaning and polishing floors – gives floors a shine, but also protects them. Our approach to wood floor waxing is similar to stripping and waxing vinyl and marble as mentioned above. It is a technique that will not only keep floors safe, but beautiful. 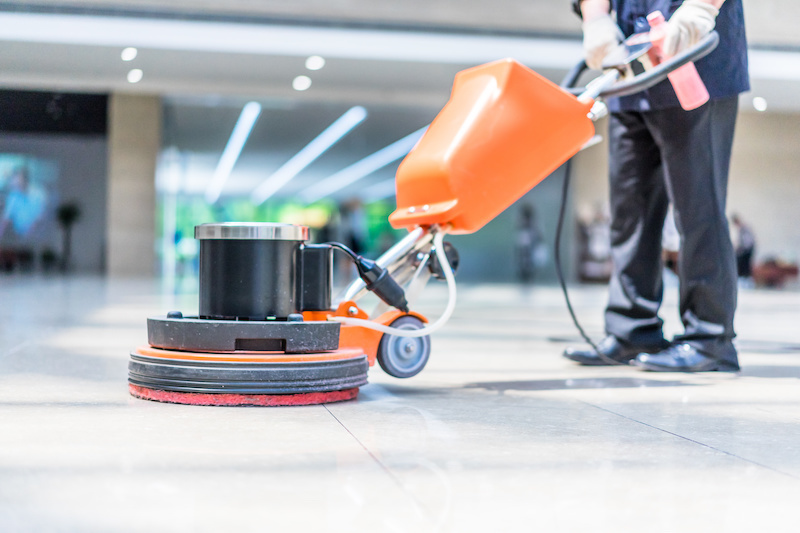 Our trained experts can handle any floor cleaning and polishing job whether it is simply routine floor maintenance or bringing a floor back to life. No matter what shape your floors are in, our technicians will make your floor look new again.